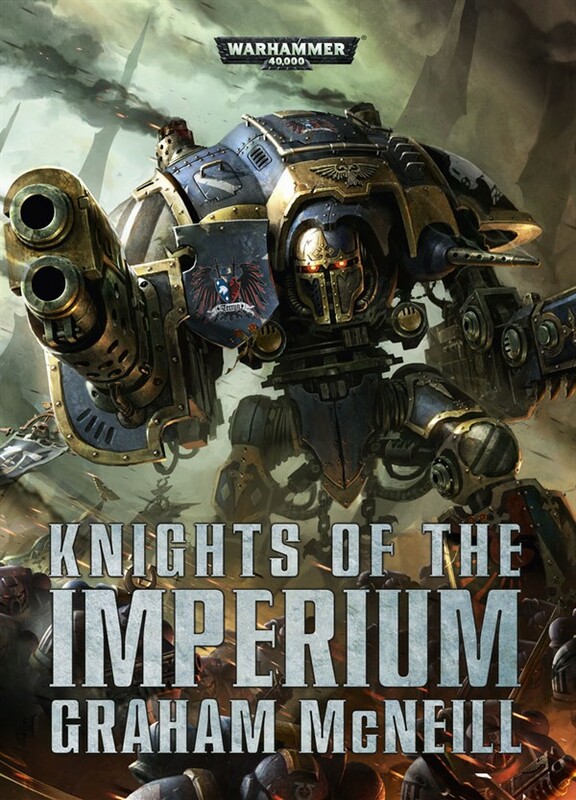 En Mars 2014 sort Knights of the Imperium de Graham McNeill. 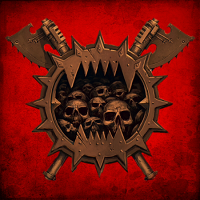 C'est une sortie pour accompagner la sortie des Imperial Knights de Games Workshop. Il s'agit d'une Novella. Au format Papier à 20 €, ou en Ebook à 10€. The swarms of Hive Fleet Hydra descend upon the world of Vondrak, and the Knights of Cadmus answer the call to war. 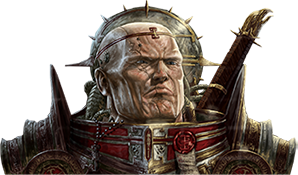 Baron Roland of Cadmus seeks to throw off the yoke of Adeptus Mechanicus control, but the lords of the Red Planet do not easily relinquish their vassals, and they will do anything to ensure that Cadmus remains bound to Mars. 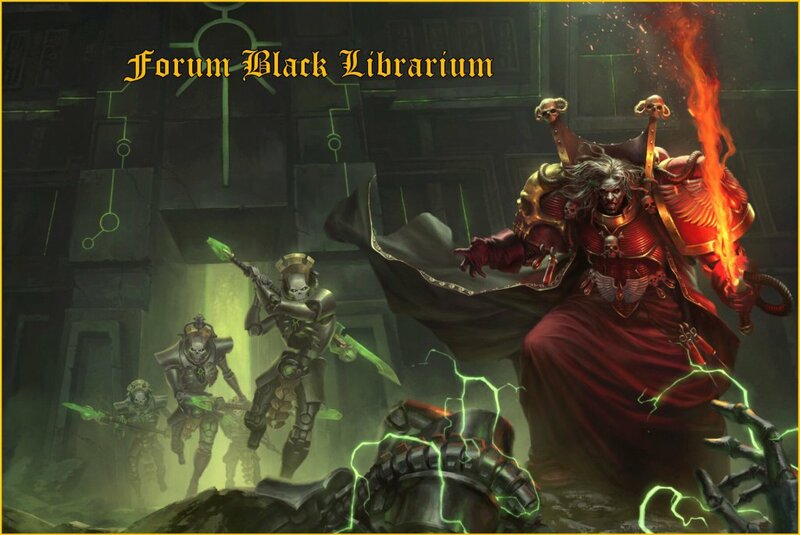 With the fate of Vondrak at stake and the designs of a feared Martian adept upon them, can the Knights of the Imperium survive long enough to repel the hated xenos? Les essaims de la Ruche Hydra descendent sur le monde de Vondrak, et les Chevaliers de Cadmus répondent à l'appel de la guerre. Le baron Roland de Cadmus cherche à repousser le contrôle de l'Adeptus Mechanicus, mais les seigneurs de la Planète Rouge n'abandonnent pas facilement leurs vassaux et ils feront le nécessaire pour que Cadmus reste attaché à Mars. Avec le destin de Vondrak en jeu, et les desseins d'un adepte de Mars craint sur eux, est-ce que les Chevaliers de l'Imperium pourront survivre suffisamment longtemps pour repousser les xénos ? The threat auspex was unable to cope with the sheer volume of targets, so Malcolm muted its screaming warnings. Targeting solutions filled his vision, but he didn’t need them. It was impossible to miss. His battle cannon tore teardrop-shaped craters in the concrete. Broken alien bodies and debris were flung skyward with every percussive detona¬tion. Stubbers sawed through the swarms of gaunts. His ammo counters were depleting at a rate he’d not known since Gryphonne IV. ‘Keep them away from the gate,’ he ordered, walking backwards between a giant metal-shaping engine and the collapsed pier of the ruined viaduct. Dozens of beasts bounded towards him. Their hind legs were obscenely strong, powering them forward in a series of leaping, clawing bounds. They barged each other in their fury to reach him. He gunned them down, but at least a dozen survived to leap towards his head. Malcolm brought his ion shield around and slammed half of them from the air. The rest met his howling chainblade and their bodies were churned to black matter. Hundreds of fanged beasts poured from a culvert a hundred metres to Malcolm’s left. He turned and twin blasts from his battle cannon collapsed it on top of them. Still they squirmed from the rubble. He heard more screeching and turned, slamming his foot down on a pack of swarming raptor creatures. The human element of Verdus Ferrox were falling beneath the claws of the xenos by the score. Half-human cyborgs and all-too-human Sacristans were being torn to shreds before they could even defend themselves. Their screams of pain cut Malcolm deep. He knew all too well the horror of being a fleshy mortal on the ground when these murder-beasts were in the wind. He saw a Sacristan punctured through his chest by one gaunt and lifted for another to snap its jaws shut on his head. Bulk servitors stood mutely as they were disembowelled. Human labourers were sliced down without mercy and left to bleed out from horrifically cruel cuts. Men and women were pounced on as they fled for the gate, scything claws stabbing them repeatedly in the back. Acid saliva burned them. Spitting darts of razor chitin sliced their legs out from under them. The gaunts fell on them all, killing and feasting. Malcolm’s stubber cut torn-meat lines through the tyranid assault, each solid slug bursting a gaunt apart. Their vital fluid was black and oily, not really blood at all, but some alien ichor masquerading as blood. The call of hunting horns told him the location of the rest of his Knights. Garratt had followed his orders and was making his way to the gate. Farrimond corralled a diminishing host with his stubbers and sweeps of his reaper. The roaring teeth of his blade threw hunks of alien flesh fifty metres through the air. Vasey held a choke-point at a culvert whose shutter remained treacher¬ously open. Alien creatures poured inside from beyond the walls. Malcolm didn’t know how they could possibly have found a way in. Every entrance was supposed to have been sealed. However this vanguard force had gotten into Verdus Ferrox, Malcolm wasn’t about to let them reach the city proper. He’d be damned if he’d allow the forward elements of the xenoswarms into Vondrak Prime through House Cadmus. Enoch and Silus appeared at his side, weapons hot. ‘Do we ride?’ asked Enoch. Malcolm wanted nothing more than to charge headlong into the gathering mass of alien monsters. To stomp and cut and blast them to unrecognisable meat paste. But this wasn’t like the Cull at all. All a Knight had to do there was kill and kill again. Now Malcolm had a duty of care to those around him. Roland had entrusted him with a duty, the honour of which it had taken Lady Cordelia’s words to make him see. The future of House Cadmus was in Malcolm’s hands, though not as she had suggested in the form of the house consorts and its children. Malcolm’s enhanced situational awareness painted a vivid picture of the battle for Verdus Ferrox. He issued his orders in clipped Raisan battle-cant and the Knights spread out. They killed the beasts attacking the Sacristans, clearing them away from their charges with accurate bursts of stubber fire and pinpoint thermal lance strikes. Some of their own were lost in the shredding barrages, but better some than all. The head-section of his Knight exploded in a roiling fireball of white-green fire. ‘Imperator!’ swore Malcolm, as arcing whips of lightning coruscated over the molten ruin of Vasey’s carapace. He saw a charred body wreathed in spectral flames fall from the Knight. A ghost trail of shimmering fire reached back to the culvert he’d previ¬ously brought down. Enormous chunks of rubble floated impossibly in the air around it. ‘Raisa’s horns, what is that?’ said Enoch. A bloated creature with a serpentine body folded back on itself hovered in the midst of the floating rock. Its head was an elongated hydrocephalic nightmare of rippling flesh and segmented plates. Atrophied limbs and vestigial appendages hung from a body undulant with peristaltic motion. A shimmering haze of psychic energy hung around it. Malcolm’s gun-auspex struggled to acquire it. He pushed out his armour’s power systems, charging towards the sus¬pended beast. Its head turned towards him. Fangs bared and black eyes glimmered with corposant. His battle cannon bellowed again. More bodies disintegrated and blew apart. Even those beyond the immediate blast had their internal structure pulped by the overpressure. The zoanthrope remained unharmed, the fire and shock of the blast morphing around its body as though it existed in its own personal bubble of space. Packs of gaunts raced to meet him, praetorians to the withered beast. His reaper blade swung and a score of beasts died. Black ichor sprayed from sundered chitinous bodies, and he revelled in their screeches of pain. Stubber fire flensed them. Bodies burst and ripped open. Malcolm’s bulk was a weapon too. He stomped with heavy feet, crush¬ing bodies with every step. He was close now, almost close enough to strike. He saw the swollen zoanthrope’s flesh pulse with its own internal illumi¬nation. That same light shone in the eyes of the gaunts snapping around him, as though it drew some vital essence out of them. A shrieking blast of the same white-green fire that killed Vasey thrust towards Malcolm like a lance. He threw up his ion shield and felt the searing heat of impact. Malcolm convulsed on his Throne Mechanicus, his arm feeling like it was bathed in melta fire. Emerald sparks exploded from his pict-slate and fell from the cabin roof. Though he knew his flesh arm was unhurt, the repercussions from the connection pain would be just as real. His Knight staggered, gyros straining to keep him upright. Its stumbling steps crushed a handful of gaunts, but more were surrounding him with every passing second. Malcolm righted the Knight and looked up into the beast’s eyes. They had dilated monstrously, and in those black, soulless orbs he saw himself die a thousand deaths, torn apart by its guardians and devoured morsel by morsel. He saw Cassia stripped to the bone by wriggling, maggot-like things with more teeth than body. He saw his children-yet-to-be cut apart by sickle-blade limbs and everything he ever cared about subsumed into a chittering hive where every screed of being was enslaved to the will of a monstrous overmind. ‘Get out of my head!’ yelled Malcolm, triggering a blast of ’slaught from his chem-dispensers. The Sacristans warned him against the use of so dangerously addictive a stimm, but right now he needed a dose of pure, unadulterated rage. Pain bored into every neural receptor in his skull, and Malcolm screamed as it ripped through his body. It filled his veins with fire, his mind with towering fury at the very presence of this abominable creature. It was no longer a zoanthrope, just a beast to be exterminated. It didn’t deserve the recognition of a name. Malcolm barged into the monster, slamming his head against the armoured carapace of its head. Bony plates split apart and milky efflorescent fluid gushed out. He felt its pain course through him and revelled in it. ‘I’m going to use your skin to wipe my arse,’ he said and rammed his roaring reaper blade into its writhing underbody. The fleshy sac of its vestigial form ruptured along its length at the tear¬ing impact. Malcolm ripped the blade up. Soft, squirming entrails spilled out in a flood. The zoanthrope fell from his blade in sopping chunks. Its flesh was devoid of mass, like a punctured fuel bladder. The rocks floating in the air fell to the ground, and an utterly alien death scream blew outwards like the blast wave of an artillery strike. The swarming gaunts faltered in their attack, screeching and writhing in symbiotic pain. For an instant, Malcolm dared hope that this was the only creature directing the ravenous packs. But moments later, the gaunts swarmed him, climbing his legs with desperate, slithering, scraping leaps, claws and fangs pulling them up his armour. Still mad with the ’slaught, Malcolm slammed himself into the wall. Gaunts shrieked as they were crushed. His reaper tore others from his body, but not enough. He saw a trio of beasts scramble onto his head. He didn’t need auspex or surveyors to see them – they were right in front of him. Claws slashed down the armourglass of his canopy, leaving deep scores. Fang-filled jaws worked up and down on the glass, leaving grooves of acidic saliva in their wake. The eyes of the gaunts were empty as they savaged the glass of his armour. He saw nothing. Not hatred, not anger or any emotion he might have expected from a foe doing their damnedest to end him. Just a blind urge to kill. Because that was what they were bred to do. Because a shoal mentality drove them into a frenzy. They weren’t creatures in their own right, just fragments in a hive, specks of dirt in a sandstorm. They exploded all over the glass. Malcolm felt the impact of multiple stubber rounds. Not powerful enough to harm him or penetrate his armour, but enough to register. Anger touched him at the thought he had been fired upon by his own warriors, but he instigated an emergency synaptic flush to get the ’slaught from his brain. Garratt rode into view, his armour scarred and torn around the lower plates of his legs. Alien blood soaked him to the waist. Smoke drooled from his twin stubbers. ‘The gate?’ said Malcolm, his mouth dry and gummy with stimm-residue and neural purgatives. Malcolm nodded, knowing he was in for a hell of a rough ride when the stimm-hangover kicked in. Pas mal pour la chasse aux démons..
Ils passent bien avec les ultra, dommage que ces derniers n'en aient pas eu davantage sur Nuceria ! Du McNeill sur les Knights... hm, dommage que la vf ne soit pas à l'ordre du jour. Cette nouvelle nouvelle doit valoir le coup, même si le prix est très salé. J'attends plus le Codex que ce livre là vu qu'il n'est pas prêt d'être en Français.